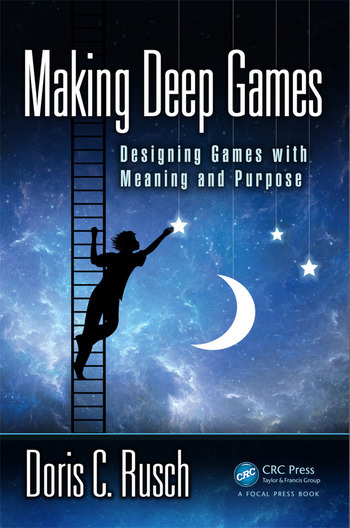 Chapter 8: The Same New Kid In Yet Another Hood – Deep Game Design as Creative Arts Therapy? Doris C. Rusch is a game designer, researcher, play aficionado and holds a position as game design faculty at DePaul University. Before that she did post doctoral work at GAMBIT Game Lab, MIT, and Vienna University of Technology (Austria). Rusch's work is focused on the theory and practice of game design, particularly in regard to games that model the "human experience". She has won numerous awards for experimental, metaphorical games, many of which contributing to mental health awareness and activism, such as Akrasia (a game about substance abuse), Elude (a game about depression), Zombie Yoga - Recovering the Inner Child (a Kinect game in which the player does Yoga poses to fight inner fears, represented by Zombies) and Soteria - Dreams as Currency (a game for teens to learn how to overcome anxiety disorder). Having completed studies in Literature, Philosophy, Comparative Media Studies and English at Vienna University, she received her Ph.D. in Applied Linguistics and Interactive Systems in 2004.